SOUTHERN UTAH — On a Tuesday afternoon when most kids have returned home from school, a group of third- through fifth-grade girls is doing laps around the track at Arrowhead Elementary School in Santa Clara. The girls are participants in the Girls on the Run of Southern Utah program, a nonprofit organization whose mission is to inspire girls to be joyful, healthy and confident. Before each lap of the approximately 400-meter track the girls are given a scenario by their volunteer coach. If the scenario was an example of encouragement the girls ran a fast lap. If the scenario was an example of discouragement the girls ran their lap at a slow pace. By the time the girls have finished they have run between a mile to a mile-and-a-half. But while the girls are racking up the distance, one of the most important lessons they are learning is how to be an encouraging friend and person and how to distinguish the difference between actions that encourage from those that discourage others. The activity is part of the Girls on the Run curriculum focus which teaches real-life lessons in hopes of instilling strong core values and confidence in these young girls. The girls are taught about bullying, self-esteem, body image and other topics which are starting to become more apparent to the girls as they move toward their teenage years, said Melissa Miller, the Girls on the Run of Southern Utah executive director. During the final section the girls pick a community impact project which benefits the girls and the community. And centered around the curriculum is running. Throughout the program girls are coached in running as they build strength and endurance. At the end of the course the girls celebrate their accomplishments by running a 5K. Besides promoting a healthy lifestyle, Miller said that running is a valuable tool in getting the girls to be able to open up and address issues in their lives, be it bullying or negative self-image, in a setting that is safe and encouraging. Girls on the Run of Southern Utah board chair Adriana Brandt started running in her mid-20s, she said, as a way to combat stress and build confidence in herself. Brandt said she was drawn to running because she could really challenge herself and she could see how beneficial it was to her growth as a woman to have an outlet that gave her such confidence. Getting to know this program and watching the impact that this can have on girls at that critical stage when they really need to be able to figure out how to be confident, how to stand up for themselves, use their own voice, set their own goals and reach it, you know, at that pre-adolescent phase when everything seems really uncertain, I think a program of this nature that integrates running can have that same type of impact and power much earlier in life and establish some habits that they can carry forward. Girls on the Run started in 1996 in Charlotte, North Carolina, with just 13 girls in its first season but quickly grew, doubling in size to 26 girls in its second season. By its third season the program had 75 girls enrolled. The program became a 501(c)(3) nonprofit in 2000 and today serves over 168,000 girls in 225-plus cities in the United States and Canada. 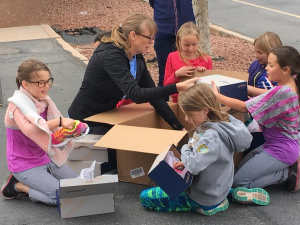 Girls on the Run of Southern Utah has grown as well, starting with only two locations, Vista Charter School and Sandstone Elementary, in its first season held in the spring of 2015 and adding three more program locations, Arrowhead Elementary, Red Mountain Elementary and the Washington City Community Center, for the spring 2016 season. To help raise money for the nonprofit, three of the Girls on the Run of Southern Utah directors including Miller and Brandt as well as board member Emma Baehr are participating in races and collecting donations which will go toward sponsoring future participants of the program. Miller will complete her first trail half-marathon (13.1 miles of trail) at Ultra Adventures Zion 100 mile, 100K, 50K and half-marathon on April 9. Miller has a goal of raising $150 for every mile she runs all of which will go toward providing scholarships to girls who need and want to be part of the Girls on the Run program. You can learn more about Melissa’s running journey and donate here. Brandt will tackle a new personal race distance — 50 miles — not once, but twice, attempting to complete the Leona Divide 50-mile run in California in April as well as the Mount Hood 50-mile run in Oregon in July. Brandt is running 100 miles in hopes of raising enough money to sponsor 100 girls to participate in Girls on the Run; a grand total of $15,000. Learn more about Brandt’s efforts and donate here. Baehr will be joining Miller at Ultra Adventures Zion 100 taking on the full 100-mile ultra marathon distance in an effort to raise money to provide new running shoes and healthy snacks for the approximately 60 girls they anticipate will enroll for the fall 2016 season. “Growing girls need nutrients to fuel these beautiful growing minds and proper shoes on those feet,” Baehr said on her fundraising page. Learn more about Baehr’s running journey and donate here. The spring 2016 season of Girls on the Run of Southern Utah will culminate at the end of April when the girls will participate in the Cotton Days 5K held in Washington City.